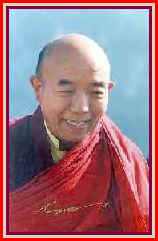 Venerable Tenga Tulku passed away in the early hours of March 29/30, 2012. Very Venerable Tenga Tulku Rinpoche is the vajra master of the Karma Kagyu. His monastery (Benchen Phuntsok Ling) is named Benchen, for the Dharma Protector. Before the initiation, Rinpoche performed the practice using the traditional instruments. While he chanted melodiously, his drum beat out our heart's own rhythm, and each sounding of the thigh bone trumpet was answered by a clap of thunder. Many of us in the shrine room (shown in the film Kundun) were moved to tears by the beauty and profundity of the offering that is the Cheu.